I think this will keep me smiling all day long!!! Too funny. And your block is fantastic - right or wrong! that is so cute. She is going to love it. so cute! 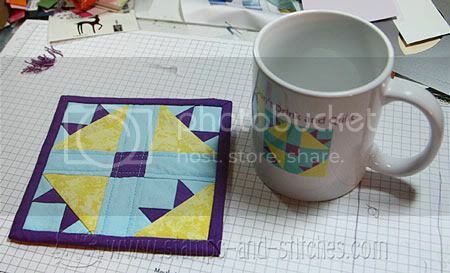 I am going to be taking a 4 week beginners quilting class starting in February and I am so excited! Hopefully someday I can be as talented as you! so funny! I manage to do that without drinking! AWESOME!!! 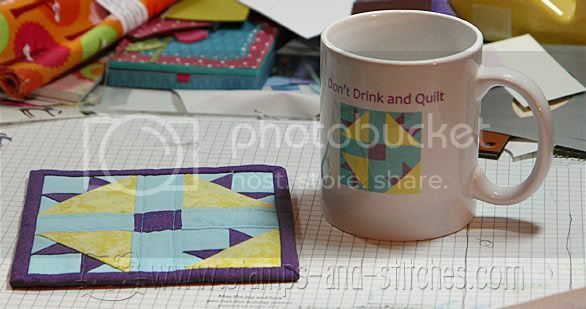 LOVE the cup but it was brilliant of you to make a matching 'messed up' block! That is hilarious! I don't drink, but I have however learned the hard way to never ever knit while I am tired because if I do, I'm likely to be undoing rows and rows of work to fix a stupid mistake!